As the holidays are fast approaching (and who are we kidding, the Christmas decorations were put up across the city in October…) we tend to think less about the more mundane, everyday things such as work, what to make for dinner tonight, and how are you going to take the kids to football practice since the car is at the garage this weekend, and more about what presents to get for the in-laws, and what drinks and food to serve for the Christmas dinner when the family is visiting. Some important elements of the Christmas meal are the drinks served before, during and after dinner. Hence, purchasing or making eggnog at home is an essential part of the holiday preparations. Eggnog is also sometimes referred to as ‘milk punch’ or ‘egg milk punch’. It is typically a rich and creamy dairy-based beverage. The ingredients traditionally include milk and/or cream, sugar, whipped eggs (for the frothy texture) and spirits such as brandy, rum or bourbon, although there are plenty of recipes on the internet without alcohol. There doesn’t seem to be an agreement on the origin, etymology, and the ingredients used to make the original eggnog drink. However, many sources claim that it may have developed from ‘posset’, a medieval European beverage made with hot milk and curdled with wine or ale and flavoured with spices. In the Middle Ages, it was used to cure colds and the flu. Posset was popular from medieval times up until the 19th century, and according to certain sources, by the 13th century monks were known to drink a posset with eggs and figs. Eggnog is traditionally consumed throughout Canada and the US around Christmas, often from American Thanksgiving until the end of the Christmas season. Note it in your calendar: 24th December is National Eggnog Day! Apparently the first US president, George Washington, was also a big fan of eggnog and enjoyed serving it during Christmas at Mount Vernon. His recipe continues to circulate widely today, even though he forgot to include the number of eggs needed. Alway be cautious when using raw eggs as an ingredient! In 1982 most of the residents and staff of a nursing home in the U.S. became ill with salmonella, and four died. The cause was very likely an eggnog made on the spur of the moment. Some recipes for homemade eggnog call for egg yolks to be cooked with milk into a custard to avoid potential hazards from raw eggs. There is a plethora of recipes online for a perfect eggnog drink, see one here. If you have allergies try the dairy free eggnog or the egg-free eggnog. It’s best to serve eggnog with sweet pastries or cookies such as gingerbread cookies, plain spice cake without frosting or anything with a sweet and spicy kick. If you feel particularly adventurous, you can pair eggnog with savoury snacks and dishes such as pickled vegetables or crudités and dip, spicy nuts, salty plantain chips. Eggnog can also be easily incorporated into your breakfast such as muffins and bread puddings or use it as a topping for a bowl of oats or porridge. Serve with with a nice cup of homemade eggnog latte! 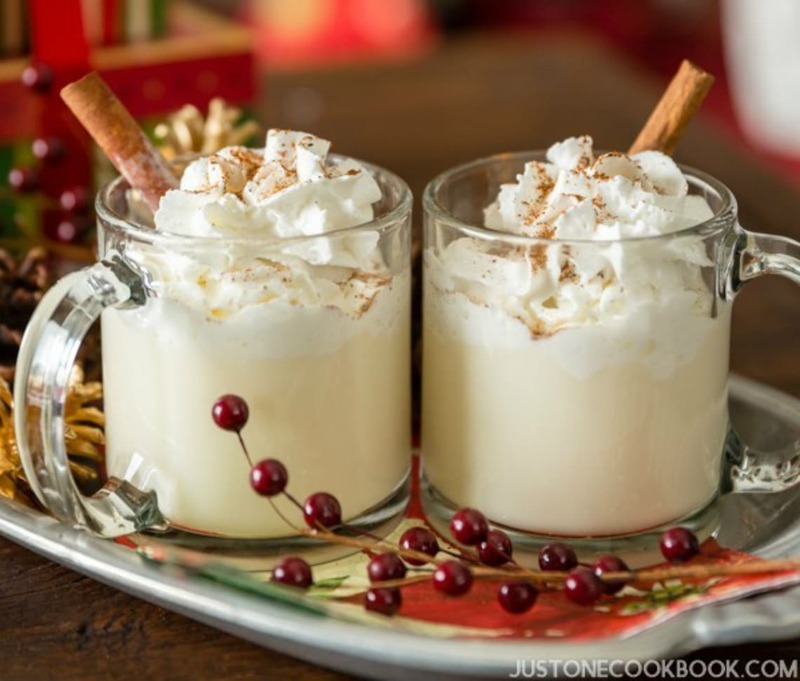 Eggnog can also act as a great basis for cocktails and desserts – easy way to impress your Christmas dinner guests!